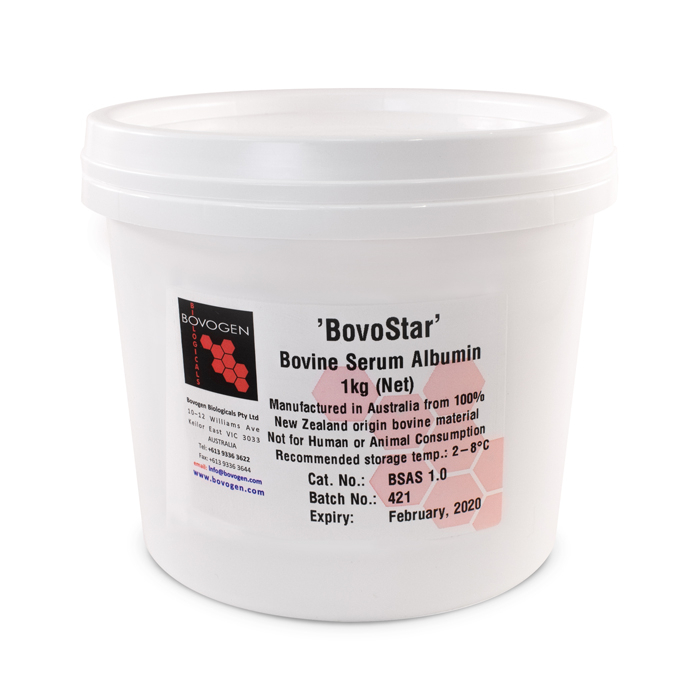 Bovine Serum Albumin (BSA) - NZ Origin - NOVA Biologics, Inc.
Our “BovoStar” Premium BSA is manufactured using a proprietary two step purification/heat shock process* to produce an exceptionally consistent BSA product. NOVA is the authorized distributor for “BovoStar” premium N2 Origin BSA for Bovogen Biologicals. Our BSA products are manufactured using a proprietary two step purification/heat shock process* to produce an exceptionally consistent BSA product that includes the following qualities: Low Endotoxin, Ultra High Purity, Ultra Low Immunoglobulin, Ultra Low Fatty Acid Content, Consistent “Batch to Batch” Properties, and Protease Free Classified**. The Bovogen Biologicals plasma used to manufacture BSA is collected from registered export abattoris under the supervision of Government Veterinary authorities. These purified proteins have a wide variety of applications in life science disciplines such as cell culture, in-vitro diagnostics, human and veterinary pharmaceuticals, molecular biology, serology, and general research. *The heat shock process used by Bovogen inactivates proteases that may be present as a consequence of microbial contamination of the initial raw material. Our Premium BSA product BovoStar is manufactured in our fully validated protein manufacturing facility under strict GMP conditions. ** This is a guide only and our formal documentation may have some variation in terminology and reported tests. Please contact us for more information. Bovogen Biologicals’ website can be viewed here.